Telltale have come a long way since the days of Sam and Max and Wallace & Gromit were there bread and butter. With the dust barely settling from the series finales of both The Walking Dead and Wolf Among Us Telltale make good on bringing us their take on Gearbox’s Borderlands franchise. Tales from the Borderlands was, if I am completely honest, one of the least inspiring Telltale titles the company has announced since Strong Bad! Where I do enjoy the Borderlands titles I’ve never really been a massive fan of the series’ characters barring ClapTrap. For me Borderlands was all about a larger than life cartoonish “Wild West” with some slick presentation portions (like those cracking intros!) and some slapstick comedy thrown in for good measure. A few short minutes in to the game and my concerns that this maybe wasn’t for me melted away. The story follows on from the end of Borderlands 2. You take the role, initially, of Rhys. A handsome corporate man for Hyperion looking to step up the corporate ladder and become the new Handsome Jack (antagonist from Borderlands 2). Hang on a moment though… this story is also about Fiona, the Pandorian con artist trying to make one big score. 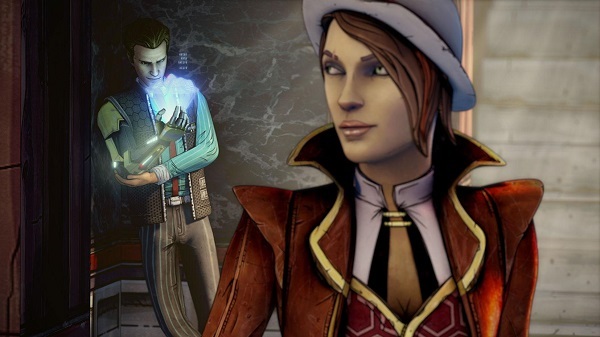 Yes, this time out Telltale have split the story between both Rhys and Fiona. Where you might be concerned stripping this down to two separate characters might hamper or dilute the story telling aspects it actually enhances it with a wonderful back and forth between Rhys and Fiona. Each trying to profess their side of the story is the correct one. The whole game has such a jocular vibe about it reminiscent of the tone used in the new Guardians of the Galaxy movie. Both Rhys and Fiona are compelling central characters which much to like and dislike about both of them. You make an almost instant bond to both though as well as their accompanying characters and one particularly awesome loader bot. Visually the game is wonderfully realised. Drawing distinct influences from the previous Borderlands titles as well as the comic book look of recent Telltale titles like The Walking Dead and Wolf Among Us it all just works so well. The visual look and feel of the Borderlands world has always been its trump card and Telltale tease it out to its full potential here. A particular favourite is the way certain important actions or new characters are accompanied by a stylised title card and raucous musical explosion on first introduction. Voice work is superb throughout – WOW what a cast of talent Telltale has put together here! 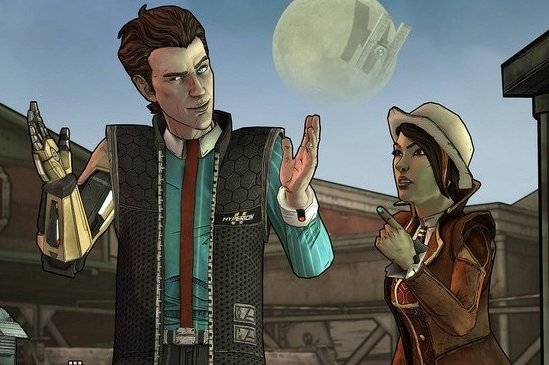 Troy Baker (every game not featuring Nolan North) is great as Rhys, Laura Bailey (Wolf Among Us, InFamous: Second Son, BloodRayne) as Fiona, Chris Hardwick (various stand-up, TV and movies) as money man Vaughn, Patrick Warburton (loads of movies and TV – notable for Family Guy) as ruthless exec Vasquez and Nolan North (every game not featuring Troy Baker) as shady dealer August. Every performance is just spot on and perfectly executed with a more than equal script to match. A solid collection of characters, pithy script, funny dialogue, strong visual style and great voice work – surely something is wrong with the game, right? How about the trademark poorly executed action sequences, there must be some of those… well not really. 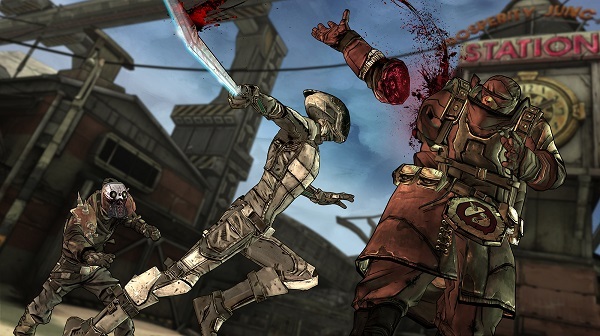 Yes Telltale have gone all out for some great action sequences here in Tales from the Borderlands which seems appropriate for the series’ roots but doesn’t usually translate well to the Telltale engine. Well, those days seem behind us with Telltale managing to execute incredibly well on the action sequences of Tales from the Borderlands. Sure it’s more of press Left, or repeated gab Q then press E but it works far better and is much less fiddly and frustrating. So much so that I start to look forward to the action sequences rather than dread them. Other key areas that have let down previous titles from Telltale have been the relative short length of the episodes and some poor technical execution. No such issues here as the game ran flawlessly (apart from Steam Cloud not syncing saved games between my devices) and clocked in at around 2 – 2:30 hours, some 30 – 60 minutes more than most of the recent episodes from the team. Tales from the Borderlands Episode One: Zer0 Sum must honestly be one of the best bits of episodic content to come through from Telltale to date. Striking and stylised visuals. Brilliant voice work and engaging slapstick comedy buddy story all conjoin with a reasonable slice of adventure-lite gaming. If any issue can be found it’s that these titles are not really Adventure games in the strictest sense, offering more of an interactive story driven experience than require any real problem solving. As someone who had little interest in the world of Borderlands let along an adventure game based in that world I have to say that I am now desperately anticipating the next episodes release and heartily recommend everyone with even a passing interest in Borderlands or Telltale’s previous works give it a try.